How To Make Money Online ...:::: Earn Methods ::::... Social media is a good source of SEO and traffic, and we should never ignore. because in year 2014 and recent days, Google count and crawl social signals as show ranking factors in search engines. But Google refused that and is not using social signal as ranking factors in search. Earlier times spamming & link building is a very easy way to get page ranking. so many webmasters like social media traffic after the December,2013 when the (Penguin, Panda) and "Hummingbird" are update. after the attack Google block Many Spammers, Websites or Blogs, and sensational changes over the world. Google and many other search like a "Yahoo" deeply involve & focus of sites reputation and apply new factors in SEO. Social Signals Are Affect Website Ranking ? if you are link to social media and your site/blog traffic are not good, so something are bad to your website. because Google are never sleep and they are know many-thing about your site behavior. search engines are catch targeted traffic and don't like paid or social networking sites. because they don't provide real and user friendly traffic. if Google show your 'Social Media Profile' in search engines, that not mean search engines like this and affect to grow your (website) page rank on search engines. Google are also see how many people coming in from social network,s and what can they do to your website. so above question social signals never affect website/blog ranking, but social signals are provide your temporary and (Non Targeted) Traffic. Social media has already being playing its role to affect SEO. Google wants natural links to your website, and socializing is the best way to get them. We are a SEO company in India who have done various experiments over this. 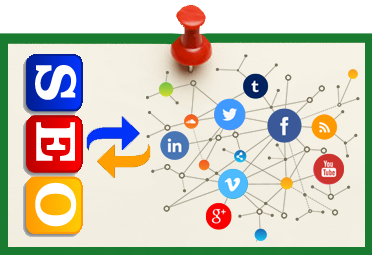 Social sites in 2015 will be very vital for SEO. facebook social media boost the ranking of a blog is not gan? or there is no relationship between facebook and seo? This is really a nice share. Social media helps to improve ranking in long run.